Sweet orange essential oil has a sweet, zesty and refreshing aroma. Sweet orange is thought to uplift the emotions, calm nervous digestion, and encourage the elimination of toxins by stimulating the lymphatic system. It is used in aromatherapy to promote happiness, warmth and to relieve tiredness. On topical application, sweet orange aids in the absorption of Vitamin C, which is linked to collagen formation and the support of the skin’s natural integrity. Sweet orange essential oil is a fruity, tangy oil, extracted from the peel of orange fruits by mechanical cold pressing, to maintain the integrity of the active ingredients and for maximum yield. 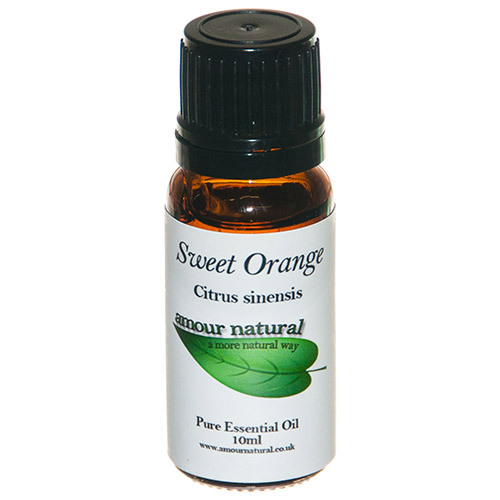 Sweet orange essential oil blends well with black pepper, frankincense, geranium, clary sage, lavender, may chang. Sweet Orange Pure Essential oil. Below are reviews of Amour Natural Sweet Orange Pure Essential Oil - 10ml by bodykind customers. If you have tried this product we'd love to hear what you think so please leave a review. Really liked this aroma. Great winter fragrance to have burning during the winter. Good fresh aroma. Such a useful oil around the house- very uplifting.